Clint Bowyer might seem a little crazy, but he’s certainly no dummy. When retired Buffalo Bills special teams ace Steve Tasker tried to autograph a football for Bowyer two weeks ago, the No. 14 Rush Truck Centers Ford driver quickly saw a sure-fire way to make his home life lot easier. Bowyer agreed with the idea to have Tasker sign the football to his wife Lorra, a lifelong Bills fan. The Emporia, Kansas native brought the football home to his wife a few days later. Lorra Bowyer is a native of Pen Yann, New York – a town of 5,000 about 120 miles east of Buffalo. More importantly this week, Pen Yan is about 30 miles from Watkins Glen (N.Y.) International, where her husband and the rest of the Monster Energy NASCAR Cup Series field will race Sunday in the GoBowling at The Glen. Bowyer met Tasker and Bills general manager Brandon Beane when he visited the Bills stadium and training facility July 19 to promote this weekend’s race. While his football loyalty is more toward the Chiefs, the Upstate New York area has a special place in Bowyer’s heart after spending time with the in-laws over the years. Bowyer hopes he’ll also have a good time Sunday in the GoBowling at the Glen. It’s the second of three road-course races on the 2018 Cup Series schedule. Bowyer warns there’s very little comparison between the high speeds of the Watkins Glen track and Sonoma (Calif.) Raceway, where Bowyer finished third on June 24. He said the key to success at Watkins Glen is getting his rhythm and timing to account for the high speeds. Bowyer played a fuel-mileage strategy last year to earn a fifth-place finish at Watkins Glen. He hopes for similar success Sunday when his No. 14 Ford will carry the Rush Truck Centers paint scheme. Rush Truck Centers has been the primary partner on the No. 14 team since Bowyer arrived at SHR in 2017 and has been with the organization since 2010. The Texas-based company has used Bowyer and the team to appeal to NASCAR fans as one way to recruit the technicians it needs to operate the largest network of commercial truck and bus dealerships in the country, with locations in 22 states. According to Rush Truck Centers, the trucking industry is expected to need 200,000 diesel technicians over the next 10 years to keep up with maintenance demands. 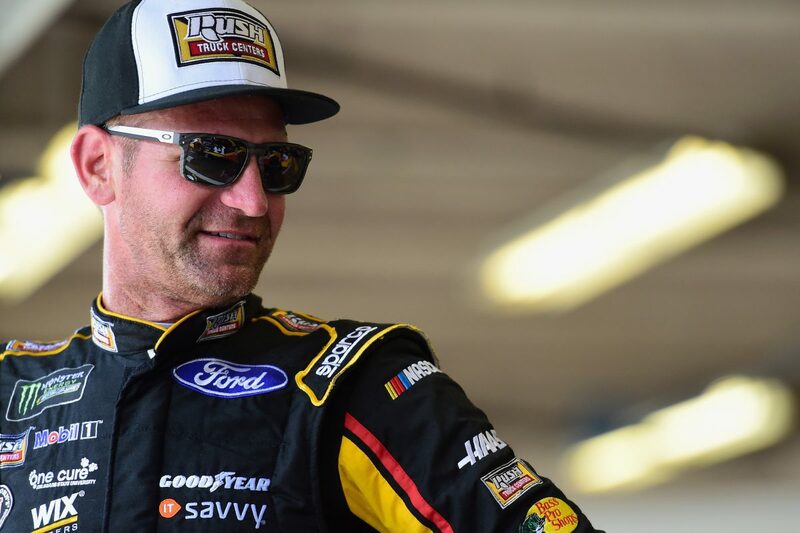 Rush Truck Centers wants to make NASCAR fans aware of these opportunities and knows that, with Bowyer’s background, he is the right guy to help get the message out. Bowyer arrives at Watkins Glen after finishing 11th at Pocono last weekend. The Rush Truck Centers team is fifth in the standings with two victories, six top-five finishes and 10 top-10s with just five races left in the regular season. Bowyer owns the fourth-most playoff points behind leader Kyle Busch, SHR teammate Kevin Harvick and Martin Truex Jr. As the playoffs approach, Bowyer said every point matters. If Bowyer can continue his recent road-course prowess Sunday in the GoBowling at The Glen, then maybe his autograph will be just as popular as Tasker’s in Upstate New York. Even if his wife prefers her Bills memorabilia. What is the key to a fast lap at Watkins Glen? What is the difference between Sonoma and Watkins Glen?